LA-based artist Jacob Kassay has attracted quite a bit of attention recently for his silver, electroplated paintings that posed a number of questions about process, time, and materiality, all while existing in an odd visual space between painting and mirror. A recent body of work continues his exploration into the basic properties of a painting as an object, as well as an art historical category. The paintings from this series are oddly shaped and made of raw linen. Their shapes (which dictate the shape of the wood support) come from fabric fragments leftover from Kassay’s earlier works made in traditional, rectilinear canvases (including his silver paintings). Kassay considers these raw linen works to be one half of a diptych that includes the first work cut from the fabric (that exists somewhere else in the world). 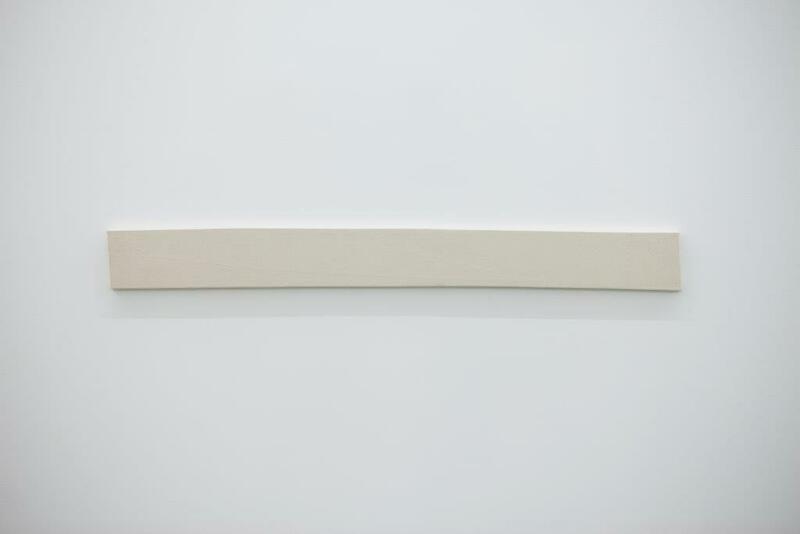 The two objects are thereby conceptually paired by sharing the same source material, though the first traditionally-shaped work defines the second, more idiosyncratic, piece. Kassay’s work has been shown at venues worldwide, and recent solo shows include The Kitchen, New York; Xavier Hufkens, Brussels; The Power Station, Dallas; and Institute of Contemporary Art, London.